We left Nong Khiaw a few days earlier than we would have liked because we decided to wanted to be in Luang Prabang for Boun Lay Hua Fai (the festival of floating boats of light downstream). 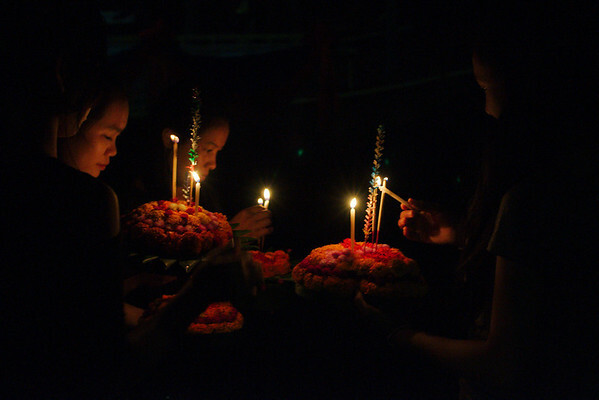 The festival coincides with the end of Buddhist Lent and is celebrated in many riverside towns across Laos (including in Nong Khiaw while we were there). In many of the villages we passed on the way to Luang Prabang colourful bamboo boats were on display in front of shops and homes. 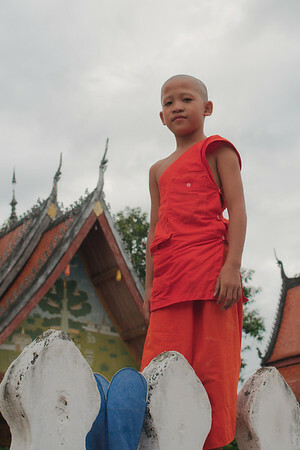 But the country's biggest Lay Hua Fai celebration is in its most popular tourist destination, Luang Prabang. Sitting at the confluence of the Mekong and Nam Khan rivers the city is an obvious choice for floating boats of light downstream. 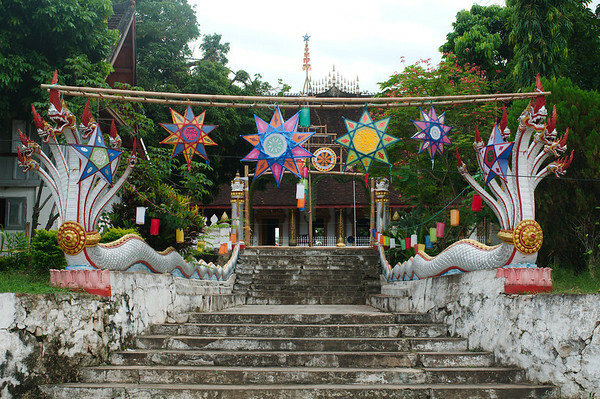 We were in Luang Prabang seven years earlier and had been overwhelmed and a little bit disappointed by how touristy it was. We came to the festival without any expectations, guessing that tourists might very well outnumber the locals participating in the event. Nothing much has changed, except maybe us. We were definitely more at ease with the comforts that we had previously snubbed. We still sought out budget options, but eating chicken sandwiches and drinking fruit shakes every meal didn't really faze us. We even bought a 5$ jar of peanut butter. We arrived the day before the festival and the whole city was in preparation mode. Colourful paper lanterns were being strung on shops and in temple courtyards, finishing touches were being made to the large dragon boat floats that would be paraded through the city, banana leaf candle boats were being meticulously assembled in every household. On the actual day of the festival the decorating-pace accelerated. As the darkness fell, the hundreds of lanterns hanging throughout the city were individually lit. The streets began to fill with procession spectators and participants. 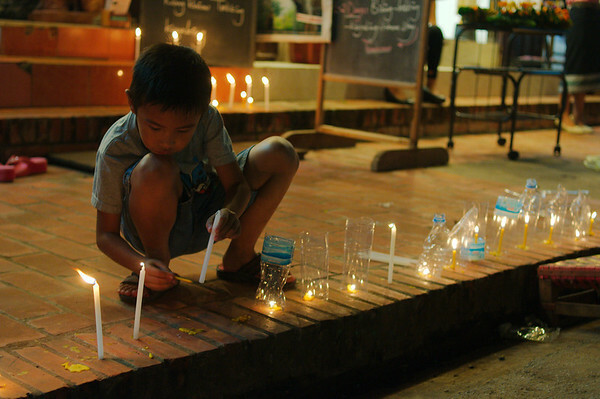 Shopkeepers and residents began lining the sidewalks with candles and lanterns. We waited anxiously with the crowds for the festival's main event, the procession of the boats of light. 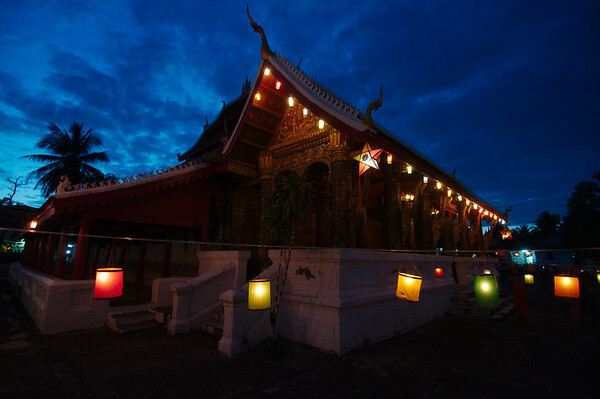 Different villages and temples build their own bamboo boats, each carefully decorated and adorned with candles. 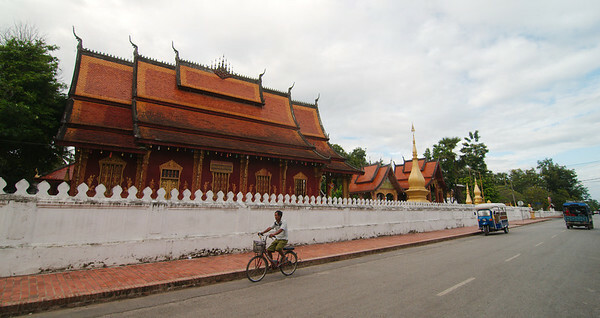 The boats were paraded down Luang Prabang's main street. 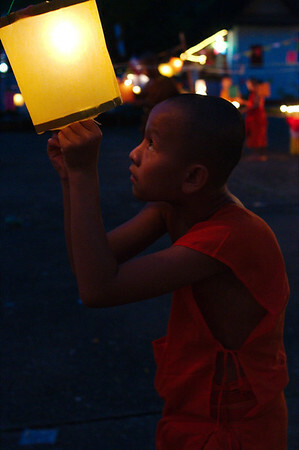 Each boat-procession was led by village representatives, often traditionally dressed carrying lanterns. The boat was accompanied by minders who made sure that it wheeled along correctly, that the candles stayed lit and that the float didn't catch fire. Tailing each float were the rest of the village representatives who sang and danced and celebrated their creation. Loud-speakers introduced every village as it passed describing each float. The English announcement for every float began with "the boat is made out of bamboo and is in the shape of a Naga". This was true. Every boat was made of bamboo and every boat took the shape of a Naga (a Buddhist serpent-dragon). But each was unique! One breathed fire, one flapped his wings, each one carefully assembled only to be lowered into the Mekong River and set adrift. Once the procession ended, tourists and locals alike made their way to the Mekong River. Thousands of small candle boats were lit and sent down river. 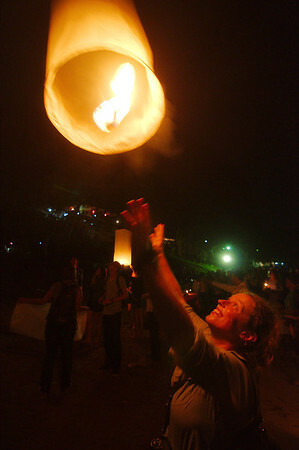 At the same time, sky lanterns (hot-air lanterns) were sent into the sky. It didn't matter how many tourists were around. No one seemed to notice the crowds around them, they focused on being with their families and friends, lighting their boats and their lanterns together. I love the video of the lights-this is amazing!